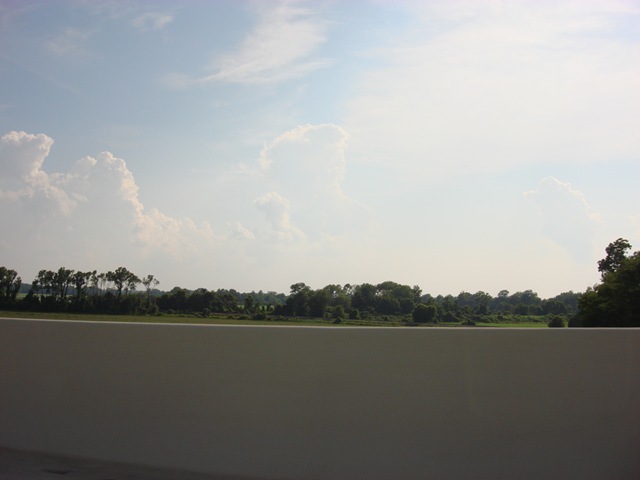 In many ways, starting one’s own business is a personal Declaration of Independence. For many business owners, the founding of their company is a tacit statement: ” I’ve done this work for years, helping others build their companies. Now it’s time to do it for myself”. Yet to build a long lasting company, one that weathers the storms of the business lifecycle, you must weave your independence into a strong network of community. In honor of this Fourth of July holiday, I am celebrating the Yin and Yang of Independence and Community by re-publishing a favorite post from my former blog, now lost in the blogosphere since I changed website hosts earlier this year. Our first stop was in Tupelo, Mississippi, the birthplace of Elvis. We had a two prong itinerary planned here, jammed into one afternoon (due to museum schedules). First to visit the Elvis birth home and surrounding park (totally worth a visit, it includes the restored tiny church where Elvis and his family worshipped until they moved to Memphis). 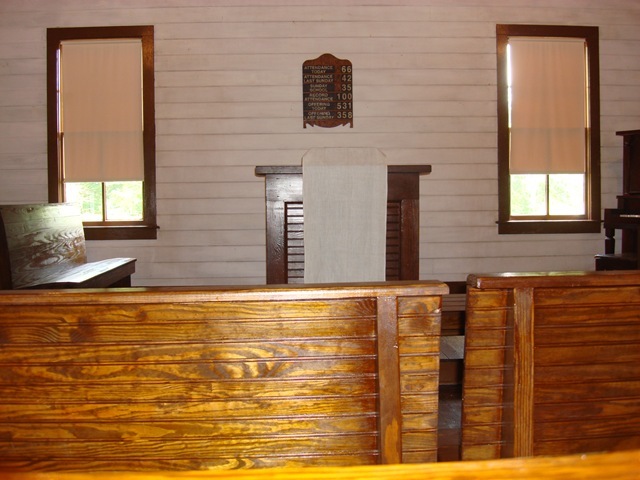 It was in this church (pictured above) that Elvis’ preacher taught him to play guitar. After we had soaked in everything we could about Elvis’ early life, we made the hour long drive to Oxford, MS home of William Faulkner and Ole Miss. By late afternoon we were quite the hungry tourists. It was Sunday, and most of the restaurants on the picture perfect town square of Oxford were closed. But we had a backup plan. My friend and guitar teacher, Chris Bowman had told me about an eating establishment just south of Oxford, in a little spit of a town called Taylor. 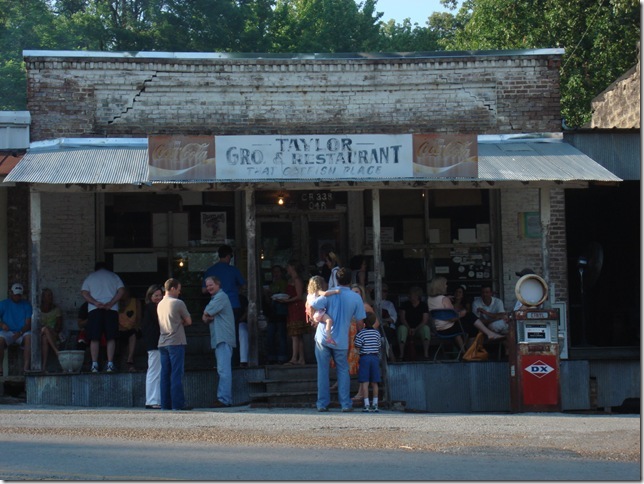 Taylor consists of a short strip of storefronts built in the late 1800’s; it looked right out of an old movie set. The buildings were all wood, raised up over the ground with a long porch in front connecting all the stores. I had been warned to be prepared to wait but I hadn’t thought that would apply to those arriving shortly after the place opened for dinner. But I was wrong. Already there were a few people sitting up on the porch, on benches and chairs. Sure enough, when we went in to see the hostess she put our name on a list and told us it would be about a 30 – 45 minutes wait. The sign out front sets the tone of the restaurant. It says “Taylor Grocery” and the tag line below is “That Catfish Place”. The restaurant site had spent most of the last 120 years or so as a general store/grocery. The story goes that at some point in more recent history, the Grocery owners started selling fried catfish and developing a extra revenue stream from people coming in to shop for other items. Over the years, the grocery gave way to a restaurant, but no one bothered to change the décor. All that’s been done is to clear out the space and fill it with rough hewn dining tables and chairs. I took a seat on a set of steps leading down from the porch to the road below. After a while I noticed a increasingly loud hum surrounding me and became aware of more people seating themselves nearby. As I looked up I was amazed at how many more people had arrived to join us in our wait for a table. 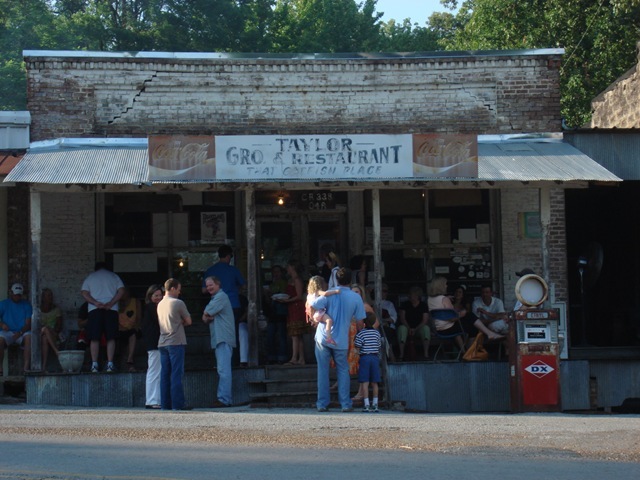 Taylor Grocery does not serve alcohol but encourages its patrons to BYOB. They bring their own paper cups too, and start sipping while they wait on the porch. At some point I got up to stretch my legs, and as I walked down the steps and turned back to toward the building, I was filled up with the sense of the scene before me. It looked and sounded like one big tailgating party. More people kept arriving, and every few minutes someone new would show up and give a happy shout as they greeted friends and neighbors who had also ventured out for the evening. Even though we knew no one, Mr. Sensei and I were swept up in the gaiety surrounding us.